Down Town Club is a perfect wedding venue if you are looking to get married in the heart of the Old City in Philadelphia. As a Philadelphia wedding photographer, I love woking at the Down Town Club so much! We have documented more than severn weddings at this marvelous place and it already fills like family and has such a special place in my heart. 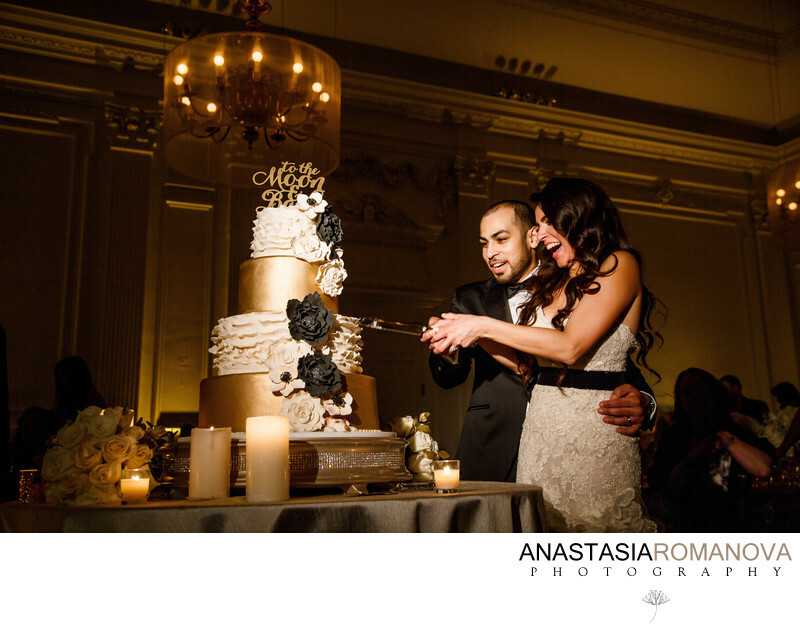 I've witnessed lots of ceremonies with different traditions and customs at the Downtown Club. I've seen all kind of various decor styles, color palettes and breathtaking first dance performances. And every time when we have another Downtown Club wedding coming up, I am getting very excited as I just can't wait to photograph another special event at this one of a kind high-end wedding venue in Philadelphia. If you are getting married at the Downtown Club in Philadelphia, you have two option on where to have your wedding ceremony. It can be held in the main ballroom or in Downtown Club's signature 'purple carpet' room. Both rooms look extraordinary beautiful and are special in their own way. In the ballroom you will have more space on the sides and will have more room for all of your reception decor. The purple carpet room ceremonies are gorgeous as all of the windows are overlooking the Old City and this space has tons of natural light. Another great feature that I really like about this room is a long beautiful aisle. It gives us photographers an opportunity to get many angles and perspectives to take during the ceremony processional. Since Downtown Club's interior is primarily very light and neutral, you cannot go wrong with any of the colors you pick for your wedding ceremony. I absolutely love the beige and white floral arrangements on the top photograph. But you can absolutely go with more brighter and vibrant colors like red, purple, orange and it will look spectacle in front of the white walls. When planning your Downtown Club wedding ceremony and reception, think of where you would like to put your table place cards for your guests. You want to make sure their are easily accessible and positioned in a nice light. From our experience with Downtown Club weddings, we usually see table place cards being laid out on a round glass table that is positioned right in front of the elevators on the Downtown Club floor. It looks amazing. Another cool feature that you can incorporate into your Downtown Club wedding ceremony is to have it unplugged. That means that you would kindly ask your friends and family to restrain from taking photos during the ceremony and just be fully present. First, you don't want that experience of seeing tons of iPhones and iPads pointing at you as you walk down the aisle. Second, the guests taking photos during the ceremony can interfere with our effort to get the best photos for you and they can accidentally block the view. I can't remember how many times we had guests rising up of their seats during the first kiss or stepping in the center of the aisle during the rings exchange. The moments happen very quickly during the wedding ceremonies and we don't want to miss any of them. If you are planning a Downtown Club wedding, I would absolutely love to connect with you! I would love to provide you with more details on how we can capture your day in the most unique way, give you an insight on what Philadelphia locations are the best for wedding photography, what are the great hotels nearby for your wedding preparations an so much more. Keywords: best photographers in philadelphia (24), candlelit wedding reception (24), cescaphe wedding (48), downtown club wedding (24), downtown club wedding ceremony (24), lux wedding philadelphia (24), mermaid bridal gown (24), philadelphia wedding photographer (450), philadelphia wedding photos (60), spring wedding in philadelphia (24).